This is it, the mack daddy of the Ascent series blenders. The Vitamix Ascent A3500 has everything you need in a blender while maintaining a beautiful physique. The Vitamix A3500 is a self-cleaning, sleek-looking, time-saving super blender. There’s more to it than that, though. Let’s dive in and see what else you will love about this top-of-the-line product. 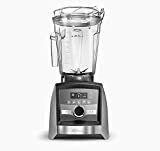 1 What’s Interesting About the Vitamix Ascent A3500 Blender? 3 Vitamix A3500 Unboxing: What Comes With It? 7 Are My Old Vitamix Containers Compatible With the Ascent? 8 How Noisy Is It? 10 Can I Find It in Other Retailers Like Best Buy, Costco, Macy’s, and Target? 11 What’s the Best Price for the A3500 and Where Can I Buy It? What’s Interesting About the Vitamix Ascent A3500 Blender? The Vitamix A3500 is chock-full of interesting features. Let’s start with talking about its design and setup. First up is the base. You can get it in the classic style or metal. I like the metal option for a more sophisticated look. If you have a lot of stainless steel appliances, the Vitamix A3500 will have you jumping for joy. Matching appliances make a happy kitchen. Beyond the metal option, you have a fancy touchscreen. If you have been present the last 5 years in this world, you probably own something with a touchscreen. It’s easier to use and just looks nicer in my opinion. Next up are the programs and settings. I am definitely a program person. If you’re usually doing multiple things at once in the kitchen (for your kids, dogs, or guests), the preset programs built into the A3500 save time and effort. Two blenders in the Ascent range have the preset programs, and the 3500 has the most, at 5. The programs are Smoothies, Hot Soups, Dips & Spreads, Frozen Desserts, and Self Cleaning. You heard me right, SELF CLEANING. I would buy this blender just for that feature alone. The self-detect technology is kind of cool, but for most people, I don’t think it’ll make much difference. It basically means the blender knows what type of container you place on it. There have been vague suggestions that Ascent blenders “adjust blend settings” when they detect the different containers, but I haven’t experienced this, nor had this claim confirmed or denied. A smaller thing “Self Detect” does is prevent the blender from turning on if the lid isn’t secure, but I’ve never particularly found this to be a problem. Despite there currently being no use for the Wi-Fi capability, it’s been suggested that this may allow owners of Ascent blenders to obtain new presets and other technology updates in the future. The details remain to be seen, but this is an exciting prospect nonetheless, especially given that with your 10-year warranty (increased from 7 years on Next Gen Vitamixes), you’ll have this machine for an awfully long time. What does all of this combined give you? An easy way to make whatever you want in the kitchen. Your blender detects the container size, you choose the program, it runs the program to give you exactly what you want, and you can walk away. When you come back, BOOM! You have your delicious concoction ready to be devoured. After you pour it out with no mess, put a little hot water and soap in the blender. Turn on the self-clean preset and let the blender clean itself up. NOTE TOO: If you do find it easier for whatever reason, you can also shove your container for the A3500 in the dishwasher (which you couldn’t do with the Vitamix 750). In summary: The Vitamix Ascent Series A3500 is one of the most independent and convenient blenders on the market. Customers, overall, are extremely satisfied with the Vitamix Ascent Series A3500. They love the programs, the efficiency, and the time they save by using this model. I don’t call it a downside, but people who are first-time Vitamix users often notice the noise. Interestingly, early indications are that the Ascent series is, in fact, the quietest model yet, slightly quieter than the Vitamix 750. A lot of people have complained about it only coming with the 64-ounce container. Because of its price, they feel that it should come with all of the container sizes. I thought this misguided, but that’s because I write about blenders for a living. 🙂 Having a model come with multiple containers would be unprecedented for Vitamix, particularly given that they lowered the price on the Ascent series for some reason (the Vitamix 780, for example, costs more!). Some people also think the 64-ounce container is way too big… which I also found odd given that the machine itself is actually a little SHORTER than the Vitamix 750. Let me leave you with one other downside for your decision: If you’re upgrading from an older Vitamix and you bought other containers for it, they won’t be compatible with your new Ascent. The self-detect technology means only “self-detect” containers will fit. Vitamix A3500 Unboxing: What Comes With It? The Vitamix A3500 unboxing is a real joy. Can’t you just smell that new blender smell through the computer screen now? It comes with the base, the 64-ounce container, and a clear lid (which means you can look into it to assess blend progress, a feature that was missing from older models), a low-profile tamper, and the Simply Blending cookbook. Oh boy, the options are endless! One of the reasons the Vitamix Ascent Series A3500 is so awesome is that it is so versatile. The programs are the obvious starting point: smoothies, hot soups, dips & spreads, and frozen desserts. That means you can use this fantastic blender to make anything from clam chowder to your mom’s famous chip dip. Nut butters are good to go. Hard, dry ingredients like coffee beans or chia seeds aren’t a problem. Flours are easy to make in this machine too. A much shorter list would be: What can’t you make with an Ascent 3500. The coolest part is that, once you get comfortable using it, you can make your own creations. You could make a chutney or your own barbeque sauce. Not your style? Why not make some creamy almond butter to go on your morning toast? The A3500 is a pretty clear-cut winner between the A3300 and the A3500. There are a lot of similarities. The biggest difference is the 5 preset programs (smoothie, hot soups, dips & spreads, frozen desserts, and self-clean) that come with the A3500. The A3300 has no programs. The A3500 also has the metal base option, which is nice, while the A3300 does not. The A3500 is about $100 more than the A3300. So really it comes down to how much you value presets. Will you use the preset programs all the time? If so, $100 won’t seem like much money after a year of regular use. The A2300 is the base version of the Ascent series, while the A3500 is the top of the line. There are quite a few features that the A3500 has and the A2300 does not have, including a touchscreen, 5 programs (smoothie, hot soups, dips & spreads, frozen desserts, and self-clean), user-set countdown, and the metal base option. The 750 Pro is a well-loved blender. Lots of people leave rave reviews on it. The 750 Pro also doesn’t have the self-detect technology that the A3500 has with its containers. This can be good or bad, depending on what you are looking for. I would say the A3500 has an advantage here because you are going to get a better blend every time. The 750 has a rubber lid that a lot of people really like. That was a complaint on the Ascent series, having a clear plastic lid. They both have the high-quality blade, motor, and control dials. I think it boils down to what you are looking for in a blender. The A3500 seems to be more convenient than the 750. The 5200 is in the C series of the Vitamix lines, which means you’re stepping down two rungs in Vitamix development from the 3500. The 5200 has no touchscreen, no programs, and no pulse setting. In many ways, the A3500 is superior to the 5200. The 5200 is cheaper, but if you’re investing this amount of money, I really recommend just making the leap and getting the most up-to-date product that gives you the longest time with the best technology. The A3500 and Blendtec are both high-quality blenders that are commercial grade. The Blendtec has multiple models just like Vitamix, so it’s hard to draw up a complete comparison. The Blendtec has a 3.0 horsepower motor, while the A3500 has only a 2.0 horsepower motor. This lets the Blendtec go faster and possibly blend things better. However, I would argue that a 2.2 horsepower motor is plenty of power for a blender, especially if you aren’t using it for commercial use. The A3500 has 5 programs (Smoothie, Hot Soup, Dips & Spreads, Frozen Desserts, and Self-Clean), while the Blendtec has 6 (Batters, Ice Crush, Smoothie, Ice Cream, Whole Juice, Hot Soup). I think these kind of even out, especially considering the A3500 has a self-clean feature. There’s also the lid issue. The A3500 has a clear plastic lid, while the Blendtec has a vented gripper lid. A lot of people will prefer the gripped lid, but there are some that like to see in from the top. A preference issue here again. Beyond that, these two blenders are pretty similar, with steel blades and BPA-free containers. The Blendtec basic version is about $150 less than the A3500. I would argue the A3500 has better reviews, but it’s up to you which blender is correct for your lifestyle. All of the accessories available for the Vitamix A3500 can be found on Amazon or the Vitamix website. Beyond that, you can most likely get them in any major department store. I would suggest Amazon so you can read up to make sure it will actually work with your model of blender. Unfortunately, the old containers are not compatible with the Ascent series blenders. All indications are that it’s the least noisy Vitamix they’ve ever made. That doesn’t mean it’s quiet. You won’t want to stand next to one while it’s blending and try to have a conversation. But the percentage of owners who find the noise a true life problem is very insignificant. Yes, the Vitamix A3500 container is dishwasher-safe. By all means, you can throw (okay, don’t throw it) your blender in the dishwasher after use. However, the preferred method for cleaning the Ascent series blenders is to put a little soap and water in, then turn on the self-clean program. Let your blender do the work for you. Where can I find a refurbished Vitamix A3500? Answer: You can’t. They aren’t doing refurbished models yet because they’re too new. Can I Find It in Other Retailers Like Best Buy, Costco, Macy’s, and Target? Yes, you can find the Ascent A3500 at most major stores. What’s the Best Price for the A3500 and Where Can I Buy It? The Vitamix website lists the A3500 at $579.95 MSRP. You can buy it through the Vitamix website or you can go through other stores. I like trying Amazon first because they are very competitive in pricing and often run deals. If you can afford it, and if you value luxury, convenience, and high technology, my answer is yes. The Vitamix Ascent series A3500 is a top-of-the-line blender. It has a price to match it but comes with all the bells and whistles you could need. Being in the Ascent series line, it has Wi-Fi capabilities. That means you will be able to update things as technology improves. This will save you from having to upgrade every time a new version comes out. It’s an investment that will make your mornings faster, make preparing good meals easier, and generally add some convenience to your life.